It’s time for the reveal of the new classroom theme! The goal was to modernize my existing colors while calming the environment and making it feel like a home. I usually put our anchor charts and units of study info on the blank wall. First up will be our beginning of school anchor charts. Back wall with new lamps on sale for $5! hooray! I am sorry if some of these pictures got redundant! I tried to get every angle around the room. I am so excited about the makeover! I was overwhelmed and unsure as it began, and with the help of my mom, it started to really take shape and look the way I had envisioned. Thanks for being such inspiring teachers, friends, and colleagues! I love looking into everyone’s classrooms! BEAUTIFUL!! I love the detail of everything! I am a new teacher…my first very own class for the 2013-2014 school year and I have been so excited to get my classroom set up. I love your "homey" feeling and that is exactly what I'm looking for. You gave me lots of great ideas and inspiration!! Love, love, love your room! Wished I had your space and decorator!! I love your classroom! The chevron is so modern and your classroom feels so homey! It looks perfect, Reagan! Great job! Did you ever find out where her rig came from? I looked through the comments after yours but I didn't see anything. Thanks Karissa you can email me kdporter2011@gmail.comHey how much do y'all pay every 3 months for trash pick up? 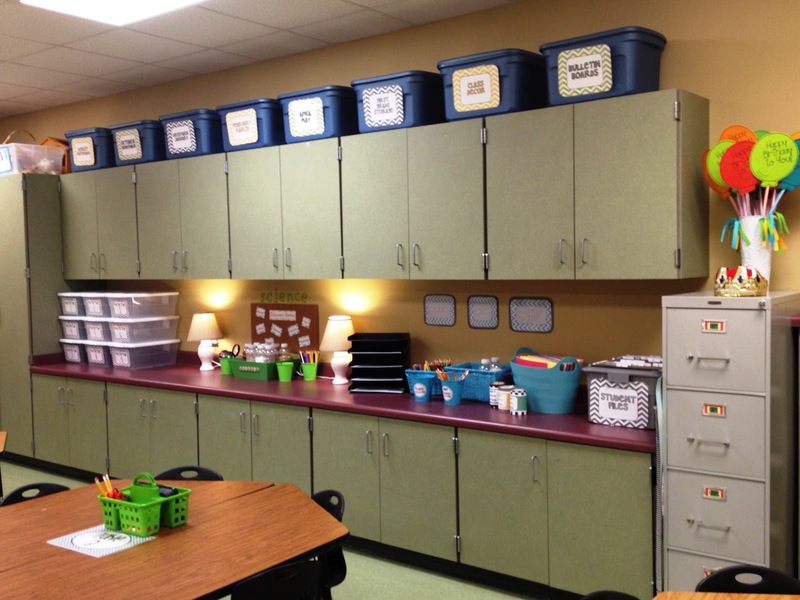 You have definitely achieved your goal of making your classroom feel homey! I'm obsessed with your cute word wall and rug! Your room is beautiful!!! I love it! I really like how you have your word wall too. Goal accomplished!!! Your classroom looks amazing! Watch our Martha….here comes Reagan! I just had to scrape my jaw off the floor!! Love it!!! The meeting area is so cute! Reagan, it's beautiful! Calm, chic, and ready for learning! WOW! I love how neat, organized, and streamlined everything looks! It is GORGEOUS Reagan! Very homey! I'm super jealous of how BIG your room is!!! I LOVE the chevron!!! Super cute!!! Wow! It looks like a cozy living room. I want to be in your class! Your room is amazing!!!! 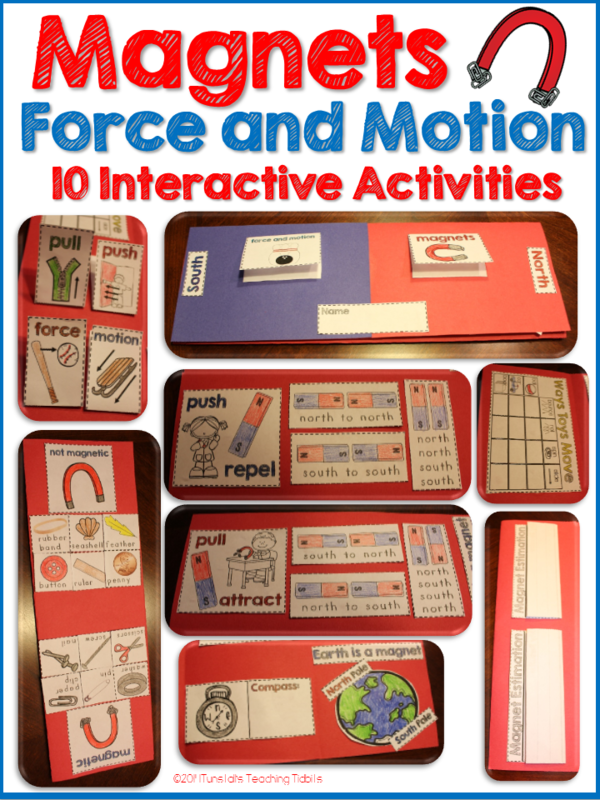 I would love to be in your classroom! Everything looks so great!! Good Job! Well, I think you accomplished your goal. I want to curl up in your library and read all day long. It's BEAUTIFUL! I love the color scheme and how cozy and neutral everything is! JEALOUS!!! Good job! It is so warm and inviting! What a great place to learn. I can't even get into my classroom until the 17th and YOU'RE DONE!! My gosh! I love it, love it, love it. It seems so calm. Holy cow, this looks good! REALLY???? I am so envious! I want to be in your class. You accomplished your goal of making feel like home. The colors, furnishings, and arrangement are -OMG!!! Words can't describe it. Wow, I'm blown away!! I love it! Your classroom looks great. It looks warm and cozy. I am jealous of all your great built in storage. I can't wait to start working on my room, but we can't get in until August 20th. Your room is amazing! I am 4 kinds of jealous! Your students are lucky to have a teacher who puts so much time and thought into their environment. How can they help but be successful!? WOW!!! What very lucky students! You did a great job!!! WOW is all I can say! It's simply beautiful! I LOVE the makeover!!!! Your room looks amazing! Surely someone out there gives out grad credit or at least awards for classroom design. We need to nominate you (and your mom)! 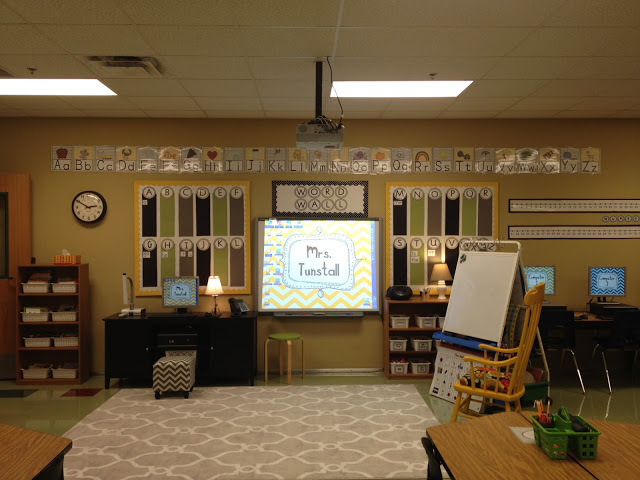 Oh my goodness, I LOVE your classroom! I want to go back to school and learn there! The colors and organization are wonderful…I'd say you definitely achieved your goal of calming and feeling like a home. So lov-errrrrr-ly! Your colors go together perfectly. I know your students will absolutely love coming to school every day! Wonderful, gorgeous and fabulous. I love it. You have done an amazing job, everything looks super !!! I like the quiet phones idea…..
OMG…I love it! This looks amazing! All I can say is A.M.A.Z.I.N.G.!!!!!! What a beautiful makeover! I'm jealous you're allowed to use fabric, and have lamps, and well . . . don't get me started. Just wanted to say you did an AMAZING JOB! Can I be in your class? I love it!! your room is so calming. I've got to steal that idea for the computer desktops! genius! AMAZING!!! Can I have those reading chairs that are in your classroom library!! WOW!!! OH MY WORD Reagan!!!! I am IN LOVE with your room! Should you ever decided to leave teaching you easily have a second career in interior design! Dang…your classroom looks awesome. SO warm and inviting. Can I be in your class?! Your room is amazing! I think you certainly accomplished your goal of making it feel like home. I'd feel at home there! I love your classroom. I love all the organizational details. Your classroom is gorgeous! I am so jealous of how organized it is. Great job! It does feel super homey! I love your small group area! I wish I had a window to put a curtain on, no windows in my room. 🙁 Your room looks fabulous! Great job! WOW!!! This classroom looks like a place I like to live in. Cozy, inviting and perfectly put together. Stunning. Wowzers Reagan!! Your room is amazing!! 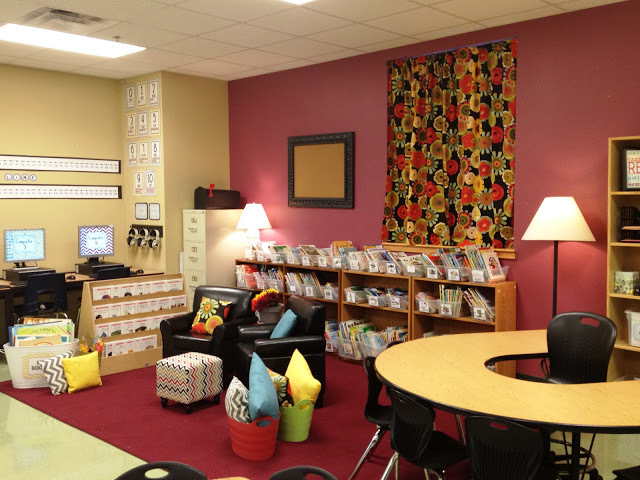 I love the paint color & the whole color scheme of the classroom. 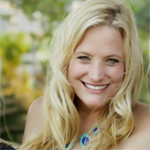 I would love to be a student in your classroom!! 🙂 Amazing job!! Wow, amazing! Your room looks so homey, cozy, and organized! 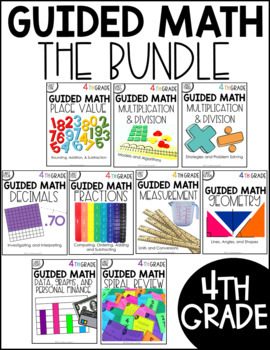 Totally jealous of your smartboard and all your computers, too… your kids will love it! Oh my! I absolutely L.O.V.E. your room! It is so calm and inviting! You are SO organized. =) The chevron really gives the room a clean, crisp look. And, I really like how you used the computer backgrounds to label your computers…what an excellent idea! Your students are going to have a wonderful learning environment this year! It is beautiful, just beautiful. 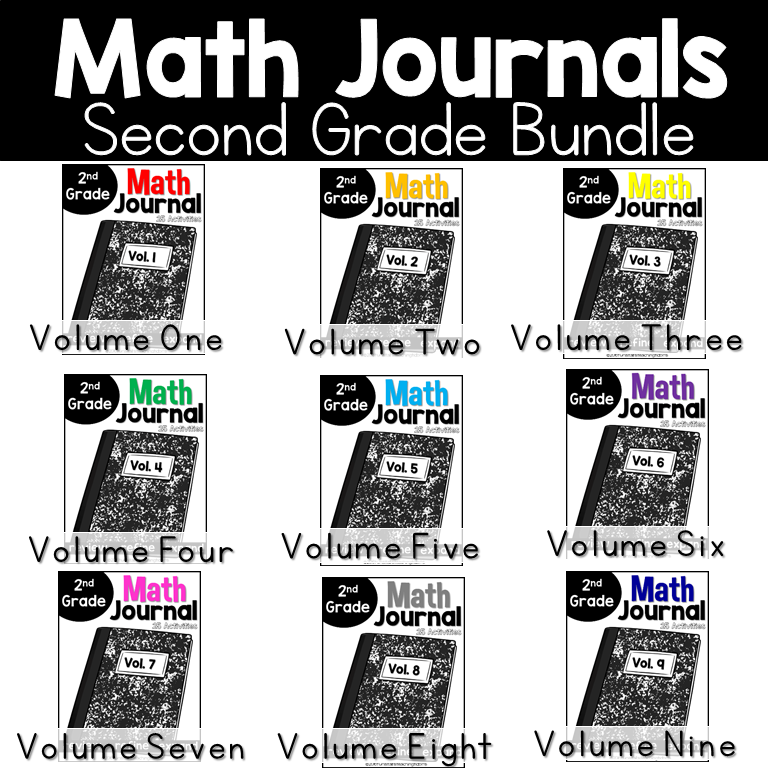 Your students are very lucky! Just fabulous! We just want to come and sit and have coffee in your class! So cozy! Love love love your word wall! Thanks for sharing! BTW, I love your the brown and turquoise colors of your blog, they are may fav! Wow! So beautiful!!!!! Nice job!!! WOW! What an amazing classroom you have! It must have cost you a small fortune but it was worth it. It is looks wonderfully calm and peaceful! Wow! 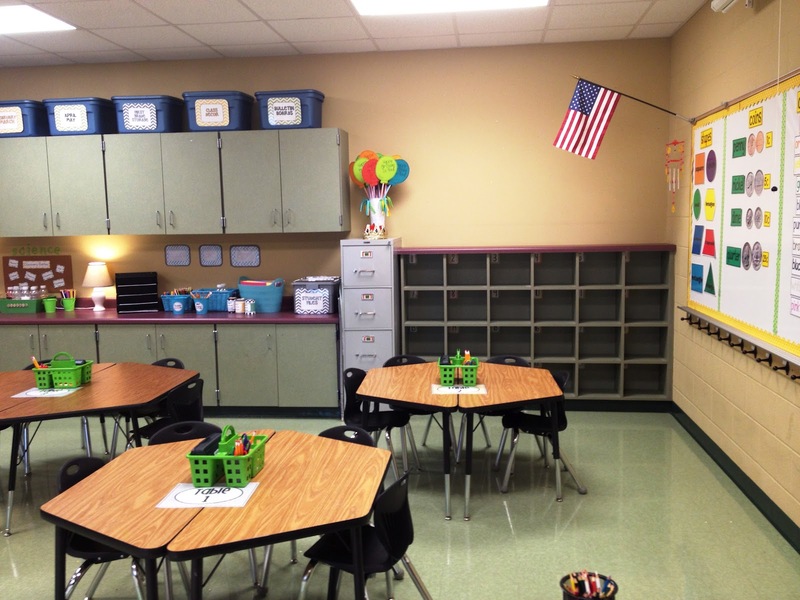 Your classroom is truly an inspiration! Love it! Looks so great. I really like the computer backgrounds and love the rug! Wow! Congratulations. You (and your mom) created a room with a great feeling of home. What a joy it will be to get there every day. Your classroom is absolutely GORGEOUS! 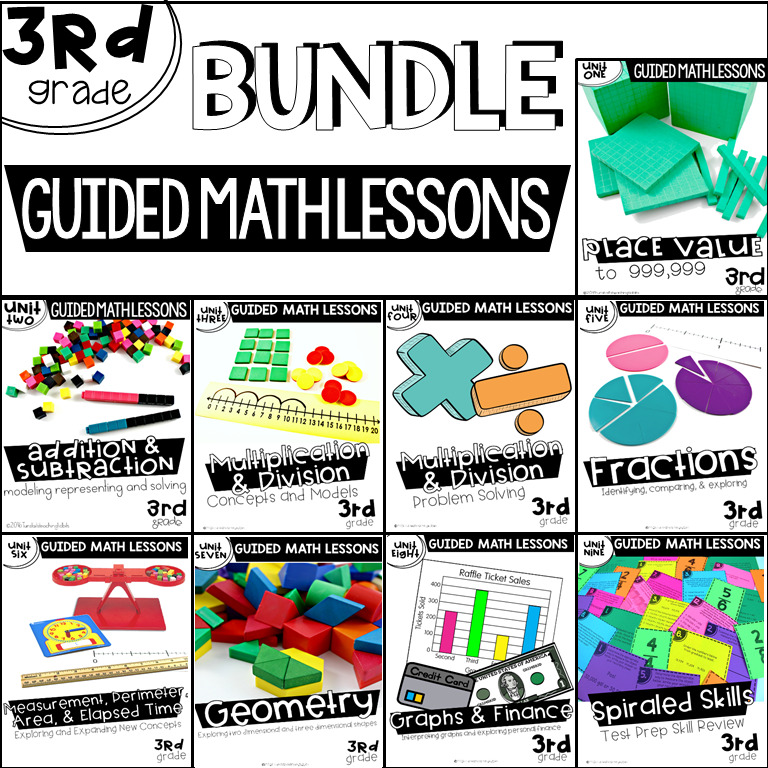 Your students are going to love it! Thanks for sharing all of your pics. You have inspired me! I think it looks stunning Reagan! It feels like home and I would love to be a student in your class! Your room is so cozy and comfortable. 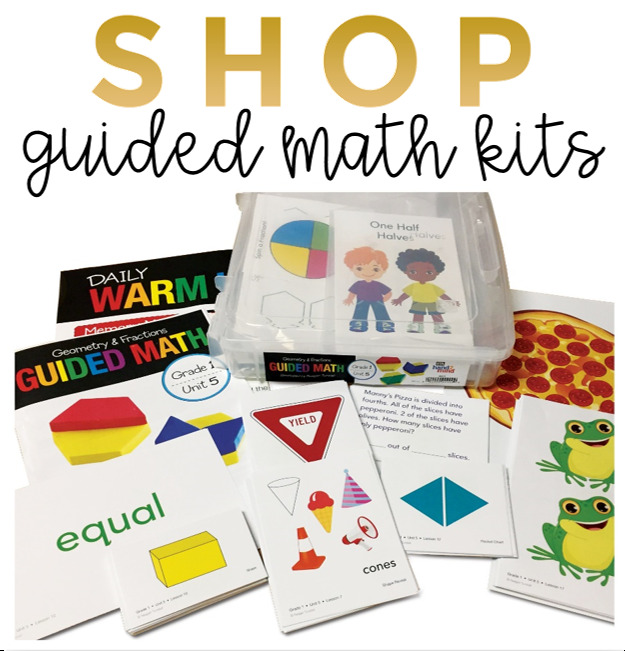 Your kiddos are going to be so thrilled that they have you as a teacher! Our rooms are extensions of who we are and what we represent. Your room definitely speaks volume of your fabulous character! 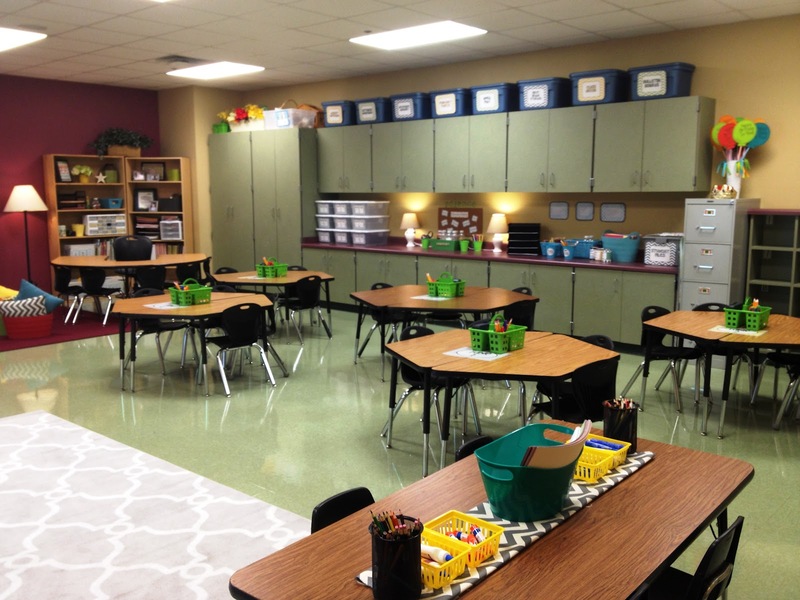 Oh my goodness, your classroom is soooooooo fabulous! It's just so pretty! I am in love. I mean, I would probably live there if I was you! It is soooo nice! I love all the details. I want to move in! Where did you get all the cute chevron pillows. runners and stool? I love it sooo much! Looks amazing!! I wish I had that much room! I'm jealous for sure!! Looks good! You have a lot of space and nice storage, too. 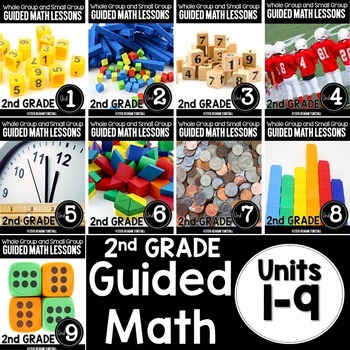 Just wondering where you got your number posters with ten frames? Wow! Your room looks fantastic! Congratulations! Your students are going to feel right at home. Oh my goodness, I didn't even know classrooms COULD look like this!! I definitely haven't been dreaming big enough. It's simply amazing! What an absolutely stunning room! I just love your colour scheme! It is beautiful, elegant, organized, and calming. I'm just in awe. Incredible!!! I love to make my room over every year but this truly fabulous!!! I'm sure the children will love it!!! Um, your room is like 12 kinds of cute. So jealous!! Fantastic! I love all the things you've done to your room now and in the past. Your classroom is gorgeous! Are you sure weren't previously an interior designer? What a wonderful room! You have a touch! 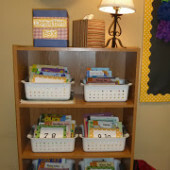 One question for you -the book boxes that you are going to put on top of the cubbies- where did you purchase them? 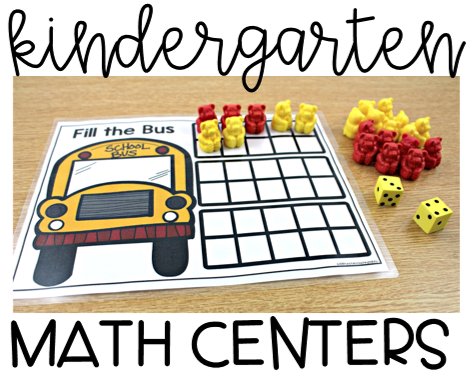 Also, do you have on your TPT site the Daily 5 posters for sell? Thanks and I am glad I purchased your binder pages and spine covers!! 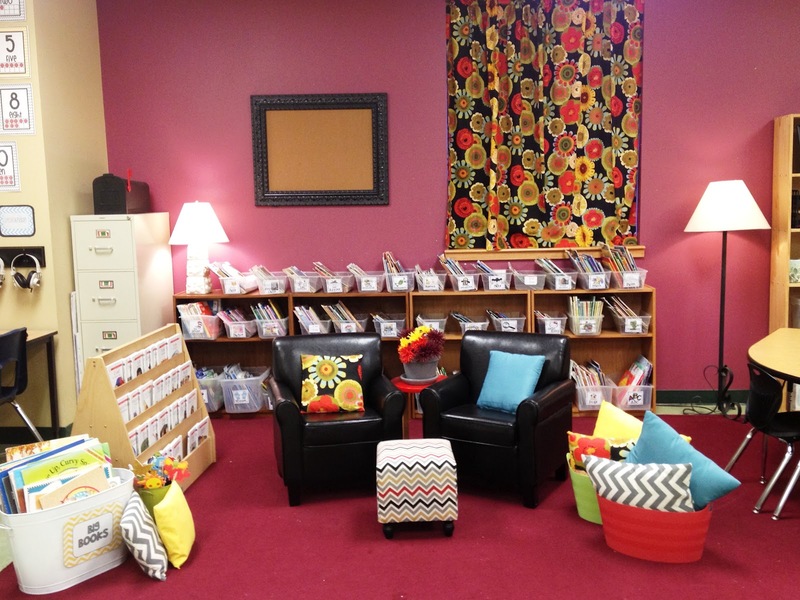 Super awesome makeover, OMG I would love to live in that room and teach, and or learn! You seem to have a ton of space! Jealous! Wow!! Your room looks amazing. I'm sure your students will feel right at home. Wow, your room looks awesome! It is so visually calming and organized, great job!! Okay- I'm inspired! Now I'm off to make some screensavers for my computers! I absolutely LOVE your classroom! It would make me excited to go to work everyday! I wish I didn't have to move out of my classroom every 9 weeks so I could attempt a room as wonderful as yours!! Very nice room! I love your cozy library area. Could you share how you made the screensavers? Your new classroom is beautiful! You worked hard and it shows! Love it! I love it Reagan! Your color scheme is great! Your room is beyond beautiful!!! I could just sit and stare at the photos over and over again. It's just perfect Reagan!! You sure have been busy! It is calm, cute and beautiful!!!! I want your tools so bad! 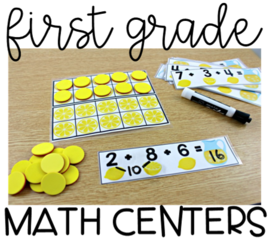 I'd use them in my house or classroom- I dn't evencare! Simply AMAZING!There are so many wonderful details, I keep going back to look agan and again! Reagan, your room looks so stylish! I LOVE all the chevron. Do you get to paint your walls? The colors are fantastic! Your kids are going to feel so welcome in your room! WOWZA!!!!! That looks AMAZING!! You did a terrific job! What a COZY, COZY room! I could live in there! It is just beautiful! Beautiful room!!! 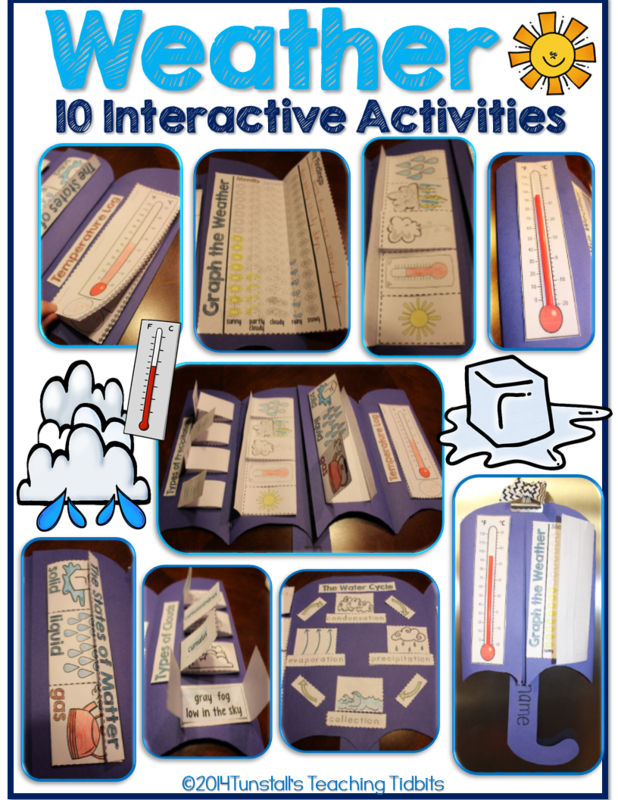 Did you make the ten frames, and all the letters etc with the chevron background? 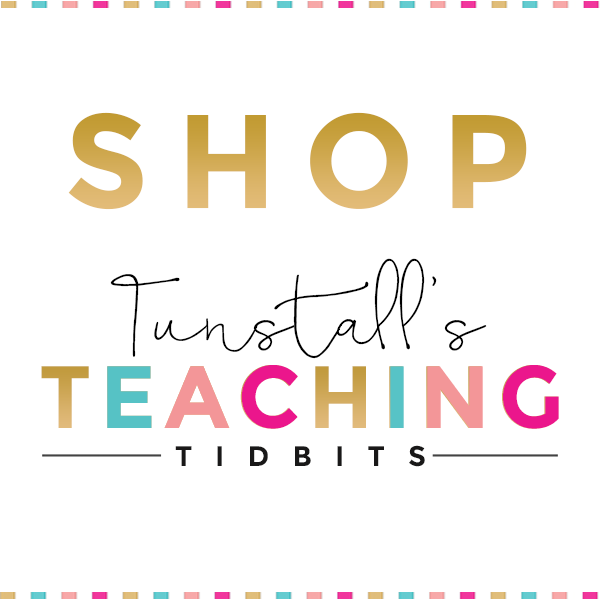 Is it in your tpt store? 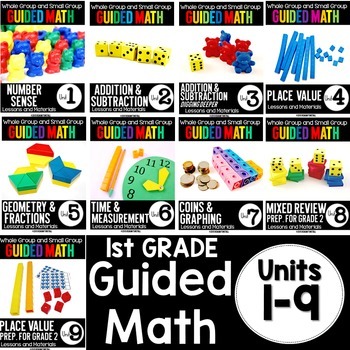 If you can please link it, I would like to purchase those for my classroom. This classroom is AMAZING! 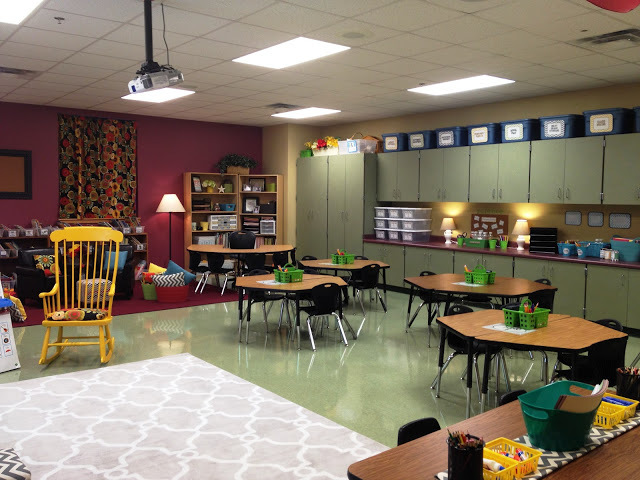 This is the room I want to walk in with my daughter on meet the teacher day! 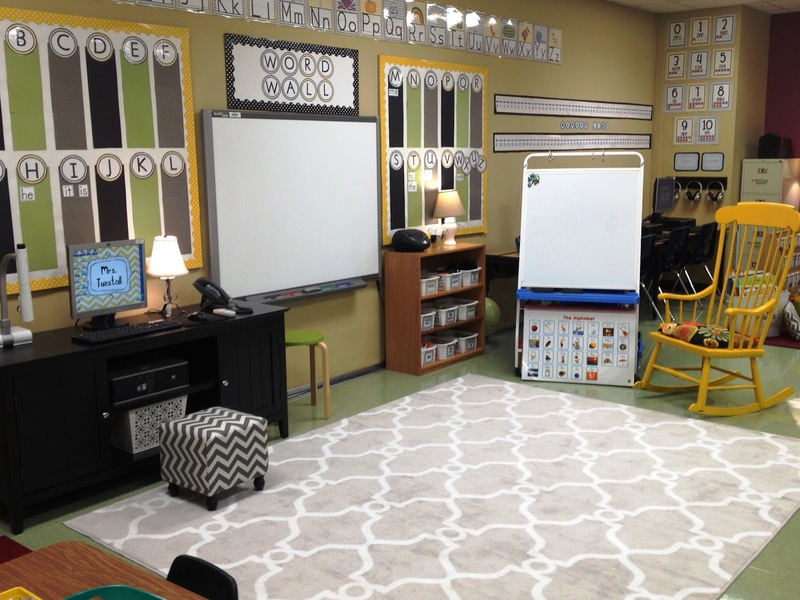 You're classroom is amazing and it is quite obvious the passion you have for teaching. 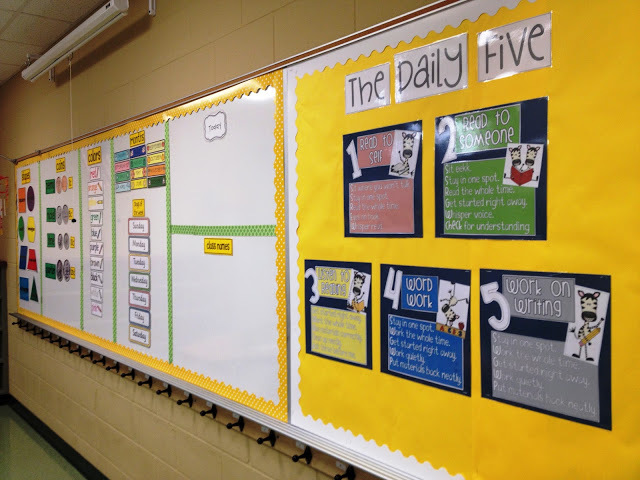 I would love to use your Daily Five posters in my classroom;however I can seem locate them. I have tried a couple of the links that you suggested and still have been unsuccessful. Can you help me? I've included my email address, if needed. I was hoping to leave you a special note – but everyone has already said it! 🙂 Your room is amazing! and you are so lucky you could paint walls! wow – I'm definitely pinning this to gaze upon for inspirations! Your room is amazing! 🙂 I LOVE your big book tub… where did you find it!? I WANT ONE! Have a great year! Wow! This is amazing! I wanna be a students in your class! 🙂 Love it all! Looks beautiful…..Lots of time, thought, and effort. Don't you love Mom's who can sew!? My mom does the same for me! I have a question though,on your Daily 5 charts, how did you print them out with the color and the font? Did you design them yourself? If so..HOW did you do it? I really liked them. Your room is so very inspiring! 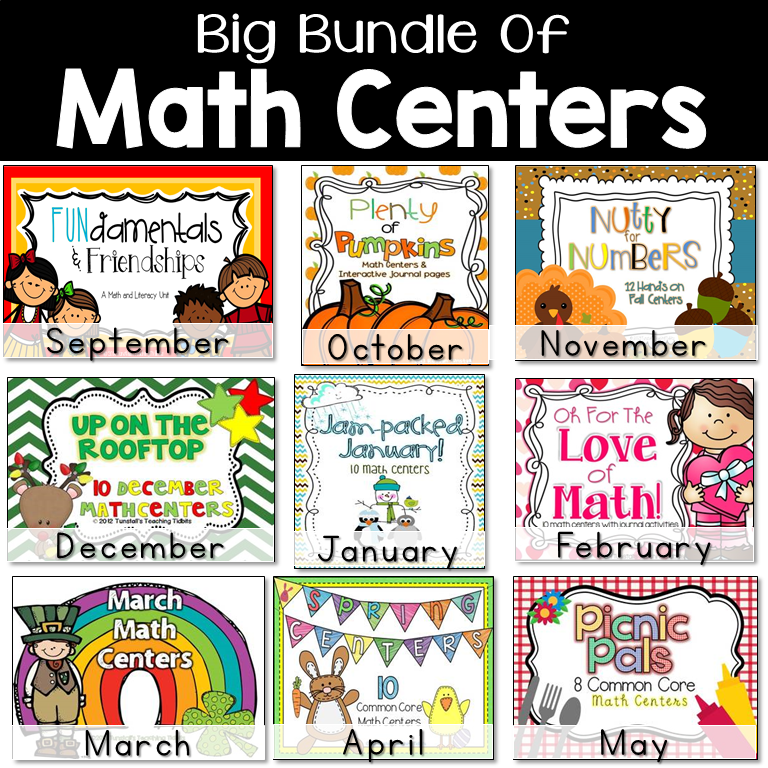 I have been trying to figure out where in the world to put my Math tubs and my back counter is completely empty and looks much like yours…perfect!! Thank you! I am so jealous…your room looks "bee-U-tiful" Love it! Where did you get that rug?? I'm in love with it!! Great job creating a "homey" feel! Your room is very inviting. Thanks for sharing the final product! Your room is beautiful, it was featured in a Pinterest Email that was sent to me!! Just beautiful, your students are so lucky! WOW!!!! Looks Great! 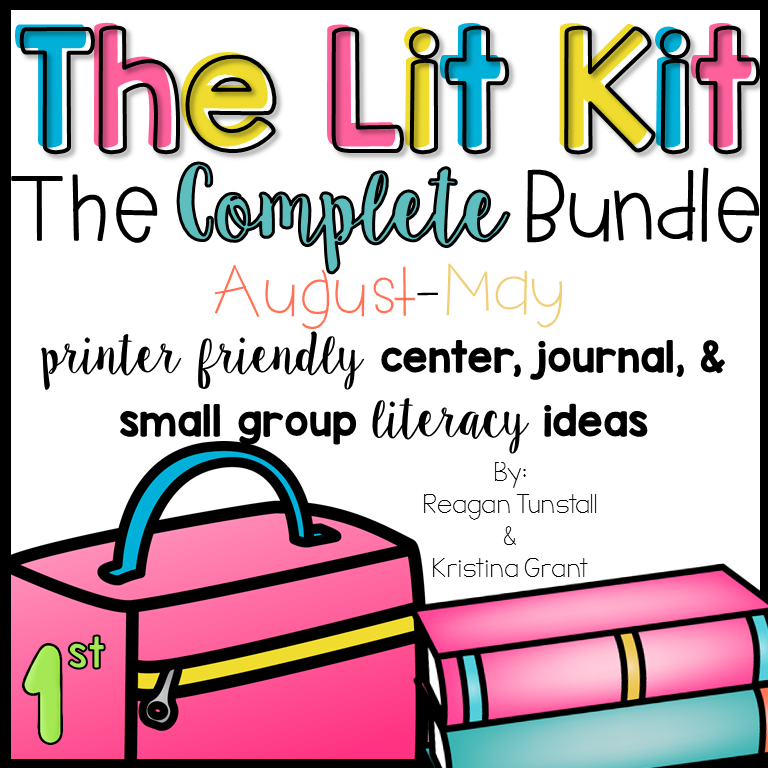 Your library is awesome – that is A LOT of work! Beautiful! What I would give for a big classroom and stores to shop at! Living on a TINY island in the Caribbean makes that really hard, as done at 19'X14' classroom! 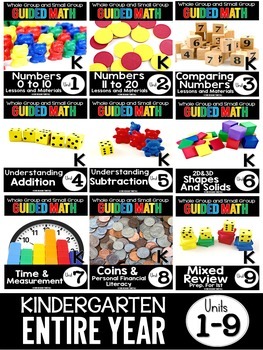 This is not only beautiful but inspiring to a 2nd year Kindergarten teacher like myself. 🙂 One of my goals for this year is to have a better system for my library. I love yours! Would you mind sharing where you purchased the shelving and bins? Thank you! Wow! 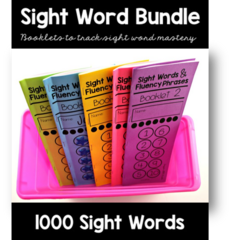 I have been teaching for MANY years and I know first hand how much time all of this must have taken you to do. It is such a welcoming and wonderful environment. I even called my 8th grade daughter to come and look at your pictures. Thanks for the inspiration as I return to school next week to set up my new room! I love your room!!! It makes me want to curl up and read! Looks great!!! Your classroom looks amazing! I'm loving that fabric for your pillow and curtains. Where did you find it? 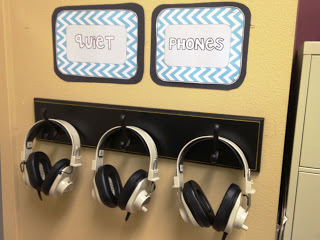 I've been searching for something similar to tie in the orange , green and yellow 70's theme in my classroom! Great job! What a lovely job! Your room is so spacious. Job well done!! Your room is AMAZING! I love how everything is so coordinated and how the space flows. Beautiful job…Cuz I know that doesn't happen easily! WOW!!! Your room looks like it is from an up-scale magazine!!! Can I be in your class??? I am inspired to go into my room to work now!!! Love your ideas! I love how classic your room is! It's kid friendly and yet very adult. Amazing!! Love how it turned out! 🙂 Room of the year award, for sure! Love the use of the trapezoid tables. I have rectangular tables and they take up so much space. I am going to put out an email to my fellow teachers and see if I can bargain and swap tables. Wow!!! This Is amazing!!! I LOVE everything about this room! You are fantastic and so creative! Have a great year! Can I just say beautiful!! I think your classroom looks more like a home than a classroom. It makes me want to come and stay a while. 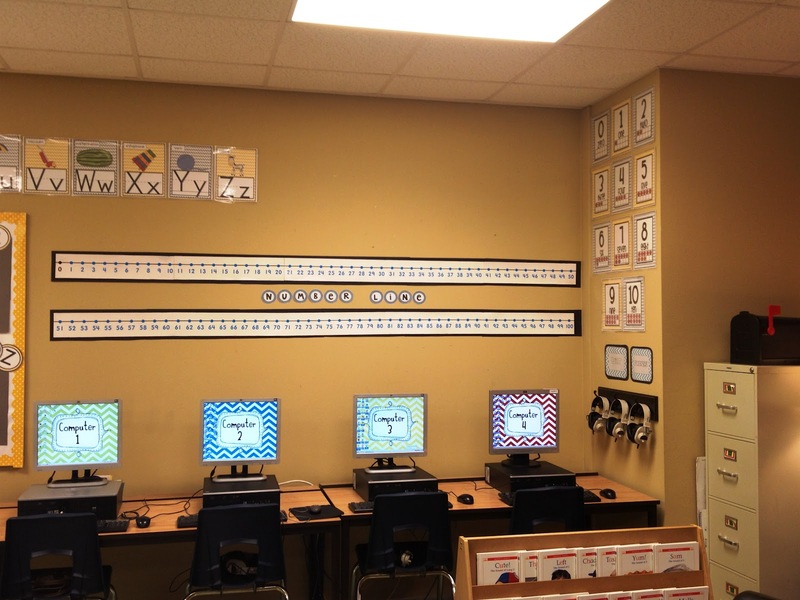 Please, please, PLEASE tell me where you got your chevron word wall decor? I am also doing my room in a chevron theme (though I could only dream of it being this cozy and beautiful;) and I have found several chevron word walls but not in the particular colors I am looking for, and these are PERFECT!! I would really appreciate it!! Your room is gorgeous!! Your students will definitely feel at home! 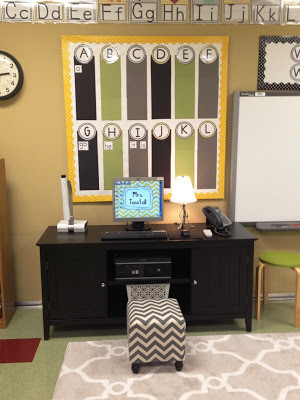 Katie king on tpt she has many sets of them search chevron gray alphabet letters and numbers. and I forgot to mention that I liked the curtains! 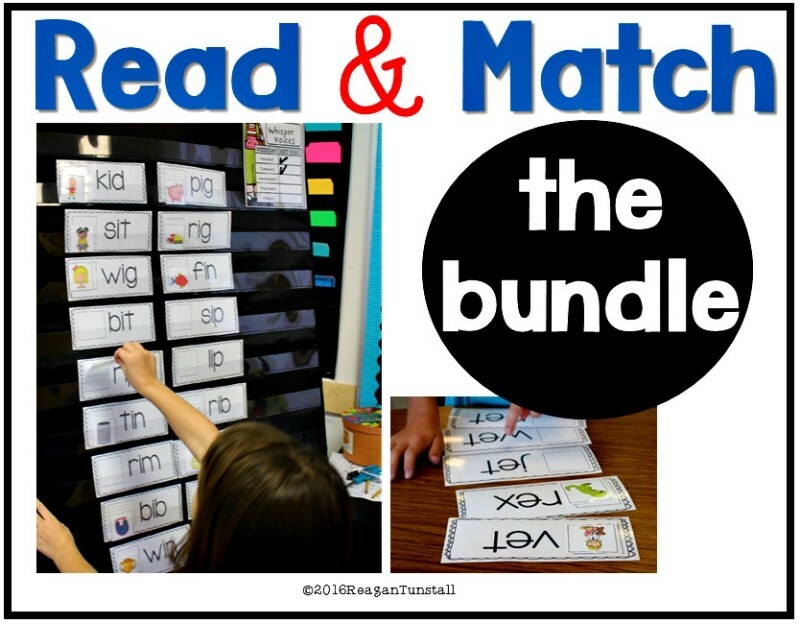 What material did you use to make the word wall solid colors? Is it fadeless paper? This room is absolutely gorgeous!! you did a really nice job! Your room looks so big and roomy. I envy you! I am just starting my own blog. Maybe you can check it out. So clean and crisp! I would love to know where you got the Daily 5 posters. LOVE LOVE LOVE them! If you made them, would you be willing to share? Thank you and have a fabulous year! 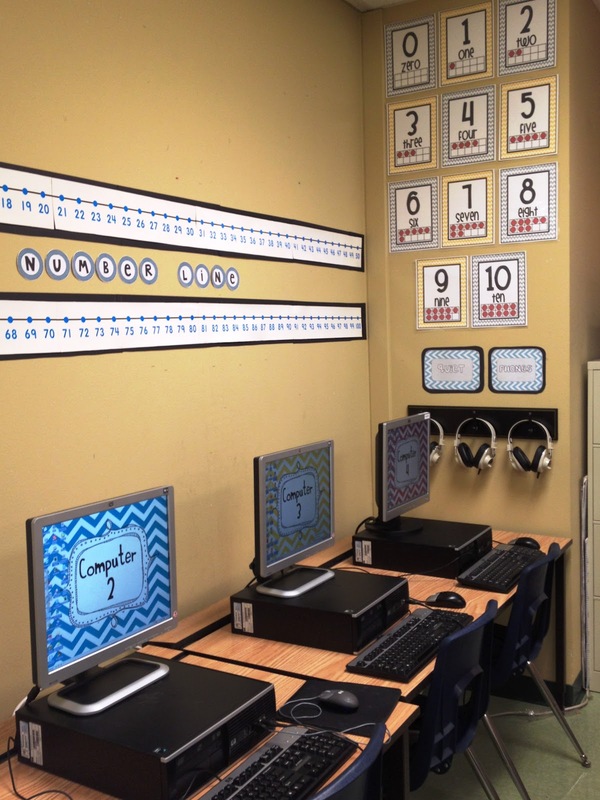 This is a simply outstanding classroom set-up. I'm a high school teacher at an alternative school and I'd love to have such a calm, welcoming environment. Looking at your room it's like walking into a home – a living room. It's simply awesome. I congratulate you on your makeover. Minus the elementary school environment, I'd love to make my room so calming. I have lamps, a lava lamp, and a candle wax burner. Kids love it, but the walls need to be repainted and it's just so crowded and busy. Your room isn't like that. It looks roomy and all. Love your classroom. Very relaxing setting for learning. Where do you get all of your labels from? Love everything. The details are amazing. My room is about half this size. I was drooling over your space. Truly wonderful. 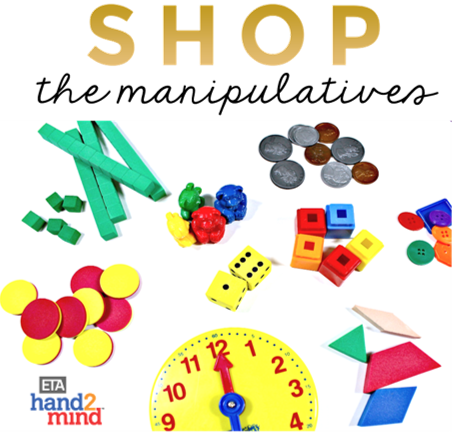 I love your items in teacher store, too! Would love to have your Daily 5 posters. Thanks for being such an inspiration! 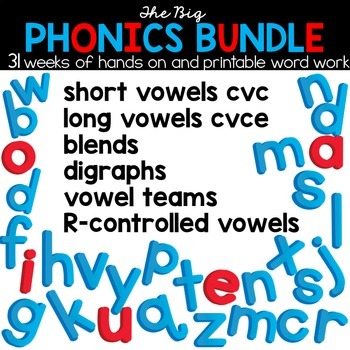 I went onto tpt and couldn't find your white chevron circle letters. What pack did you get? Stunning…I so want the rug for my house…PLEASE (pretty please) would you share where you found it? Beautiful…did you spend all your own money on your redo?? Where did you get the rug? And they small chevron chair? So homey and relaxing, absolutely love it!! 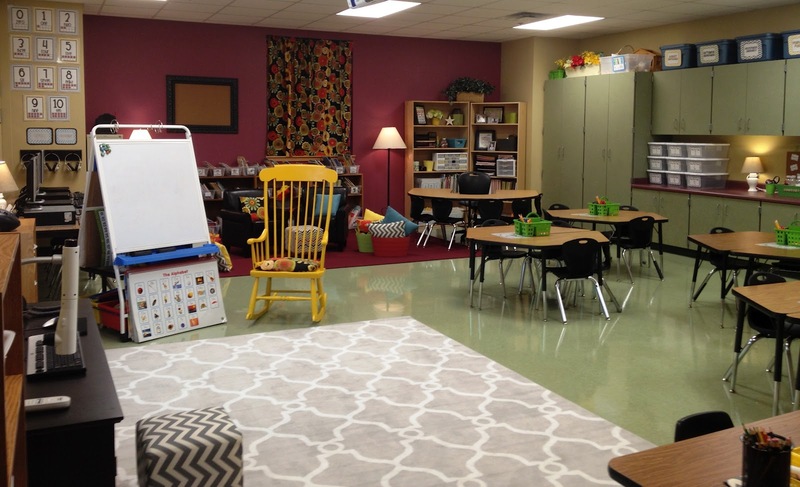 Amazing classroom… it's the kind of classroom every child should have! 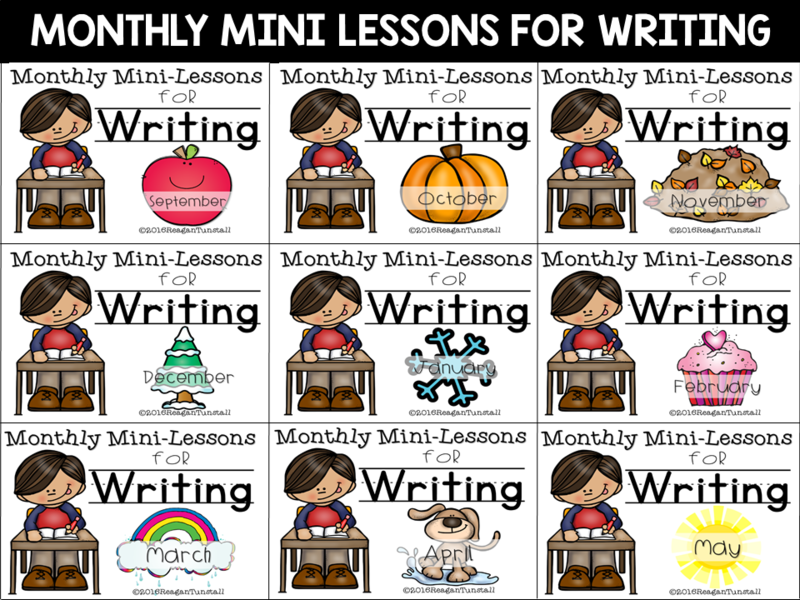 i am an English teacher from Jordan in the middle east,,i just bumped into ur blog and im absolutely amazed,,,u are really a great teacher,,,i wish we had same wide class rooms like urs. keep it up. Wow! I am in loooove with the chevron.. I also am in love with the computer backgrounds. Cutest idea ever! I will use this. Oh. My. Gosh. I LOVE how sophisticated your classroom is! I'm your newest follower. Your room looks very inviting and calm. Awesome job, I am ready to start next year so I can redo my room. I am loving the ideas. What a beautiful classroom. I hope my future will look something like this someday….WOW!! At what age did the higher-ups determine children no longer learn well in this type of environment and should be switched to wood and metal desks lined up in a row? I am a new teacher and am trying – slowly – to make my room feel like home away from home. Great job…this is my goal!! Thanks for posting. I am in hte process of redecorating and reaarranging my room with the help of my room mother. She has been great. 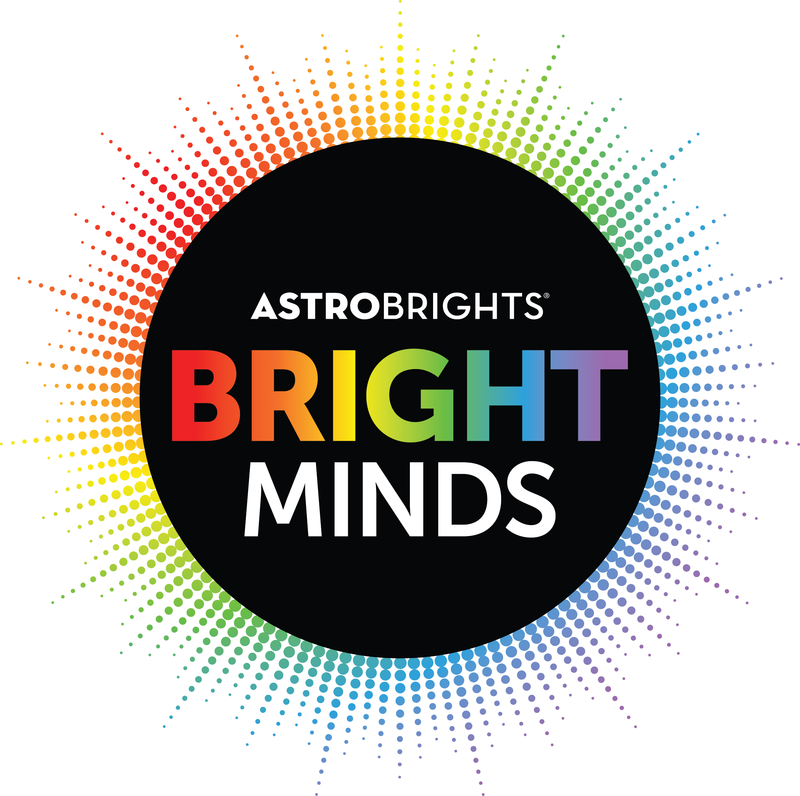 My colors are primary green (our school colors), Robins egg blue and brown. Your room is beautiful. I wish mine could be like that. We have no storage space in our rooms. Oh what I would give to have cabinets to store things out of sight. Thanks for sharing your pictures. The only thing I didn't see is where the students put their book bags. I am simply in awe of how warm and charming the room feels. Well done! I graduated 4 months after my first son was born. I had planned on teaching for a while before we had kids, but God showed us his plan 🙂 After seeing your room, it makes me excited about teaching again! Maybe one day, God will put me back in the classroom, but for now I am content and happy that there are teachers who clearly still care about their kids!!! No one who didn't care, would put this much effort into their room. Oh my word, this is the most beautiful place I've ever seen. You are very organized and have an eye for all things lovely. Enjoy the rest of your year. 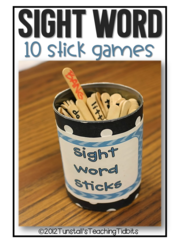 One word sums up your classroom: Wow! 🙂 I dream of a room like yours. Where did you find your big book tub? Unbelievable! I could live there!!! It's inspiring me to go organize and rearrange my room today! I agree….I could live in your room! The colors are beautiful. Did you paint it? I'm getting so inspired seeing everyone's rooms. Mine is so plain but that is how the school was when I came. We couldn't use bright colors or fancy borders. Everything had to be muted tones. I love your color scheme. Warm without being plain! It also makes me crazy that I have really no bulletin boards! My room is getting a makeover this summer!! THANKS for sharing!! I Love, LOve, LOVE your classroom!!! It looks very organized and clutter free!!! Thanks for sharing your pictures. You have inspired me so much. I know this comment is late since it is March and all, but your room is GORGEOUS!! I am so very jealous of your space. Beautiful! Absolutely, positively beautiful and so very calming, too. I love it!! 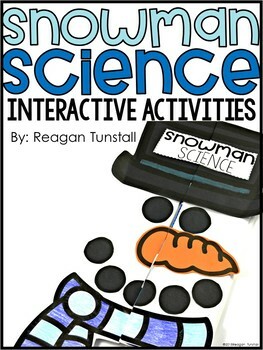 What kind of software did you use to do the computers' background and all the "fun" labels around the room? Where did you get the software? Your room looks amazing! I love the colors! The most amazing classroom I've ever seen! Great job!! It's definitely a calm learning environment! I so want to go back to teaching and replicate your classroom! Love it! This is the most amazing classroom I've ever seen! You could have a second career as a classroom decor designer. Totally awesome! I'm totally jealous -lol! I was wondering where you got your rug from. 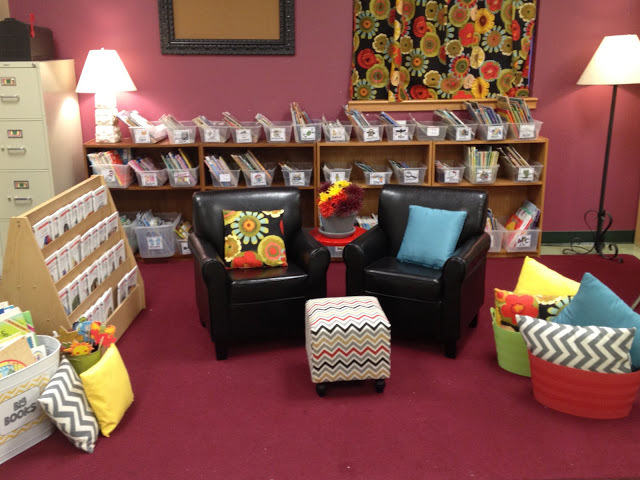 I am absolutely in love with your classroom! It looks incredible. Wonderful, wonderful job!!! LOVE YOUR CLASSROOM! Where did you find the rugs and the cute chairs? Also, where did you find the cute pictures you have on your writing board… about list, book, etc? LOVE LOVE LOVE YOUR ROOM! This is beautiful. 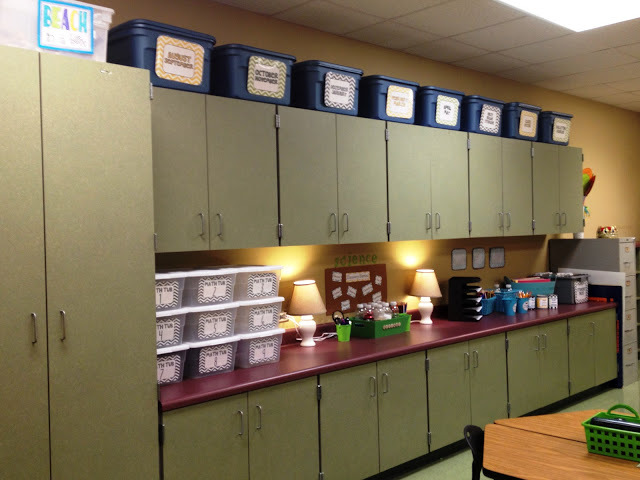 I have never seen a classroom so welcoming, organized and home-like. Gives me hope for the atmosphere I hope to create in my classroom. I love the look, but I am discouraged as I think about my own room. I have 37 students so it's mostly desks with bookcases, file cabinets and a small amount of built-in storage around the perimeter. Plus we have a host of rules about fabric, paper, furniture placement near doors/windows, and objects stored up high. Sigh. I would like to tone down some of the busy-ness that I ended up with this year, so I guess that will be the direction to go for next year! I adore your rug…can you tell me where you bought it? Amazing job! I love your classroom. It is super cute! Wow you have such a beautiful room. I am a first year teacher and I my room is ever changing. I have about 30 days left and I am still buying things and bringing them in the room. 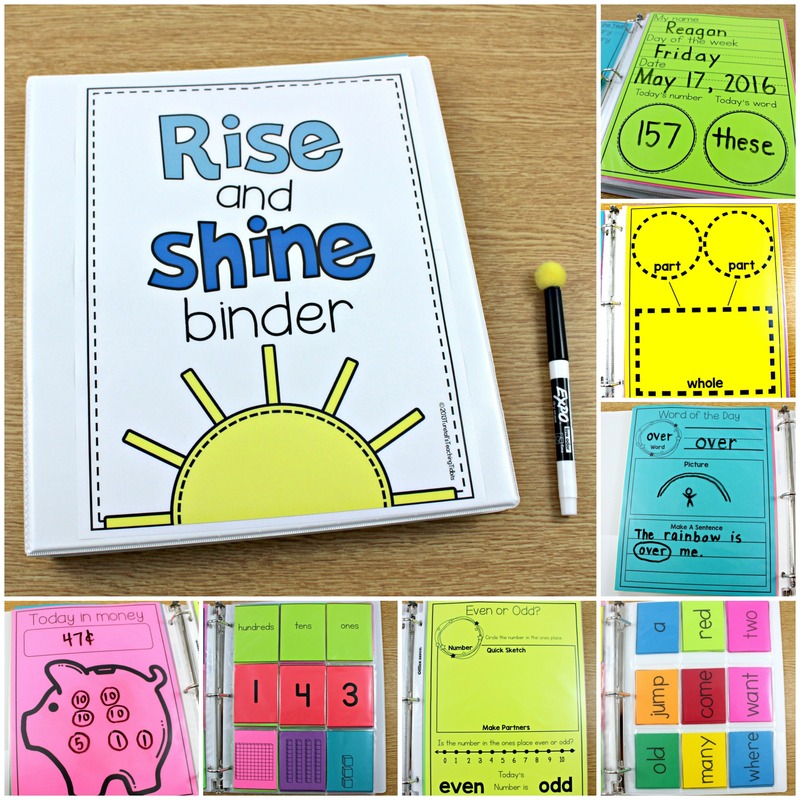 Organization is my biggest battle and I have picked up so many ideas from blogs. I am waiting on my toolbox to come in the mail!!!!! I can't believe I didn't see this sooner. Also, I have a question for you. You have bins on top of your shelving unit. 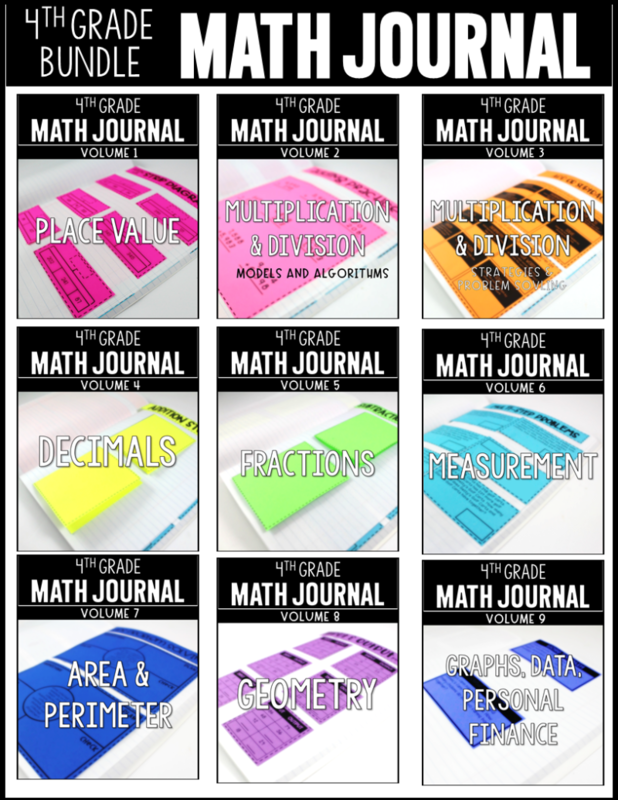 Do you have a blog on how those are organized? 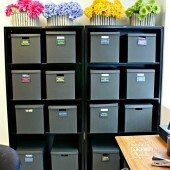 I would love, love, love to learn what you put in those and how you keep the things in them organized. Thanks so much for working hard and sharing your ideas with us. I love your classroom so much I have it bookmarked! Hello! Where did you get your stand up white board around your carpet area? 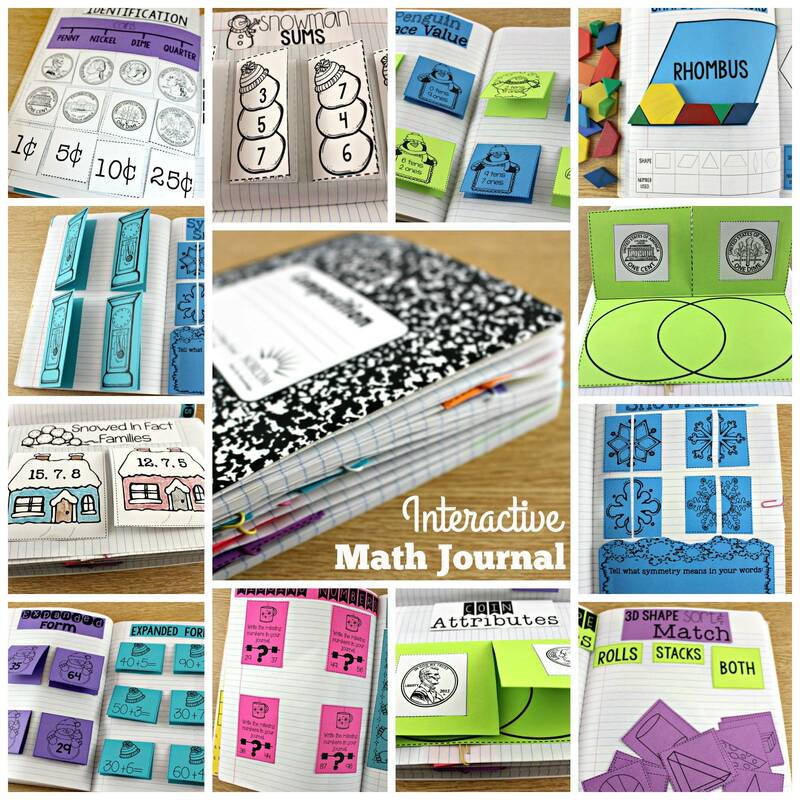 I am a new teacher and have been looking for those everywhere! My oh My! What an awesome classroom. I would love to know where you found your mini armchairs? and rug? Absolutely adorable classroom. So homey….I know your students must love your class. So great that you still get to keep lamps in your classroom. We had to take our out last year. I love trying to make my classroom feel like a home. So many of our kids don't have a warm, cozy home atmosphere where they live. Beautiful room! 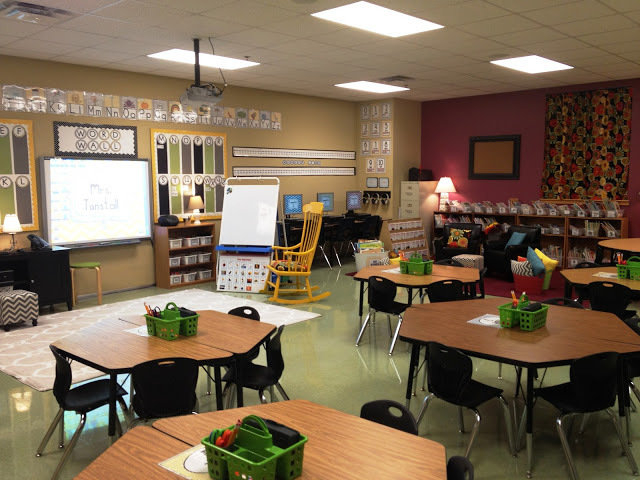 This is such an inviting classroom! Feels like home! It looks like quite a large space; what are the dimensions? 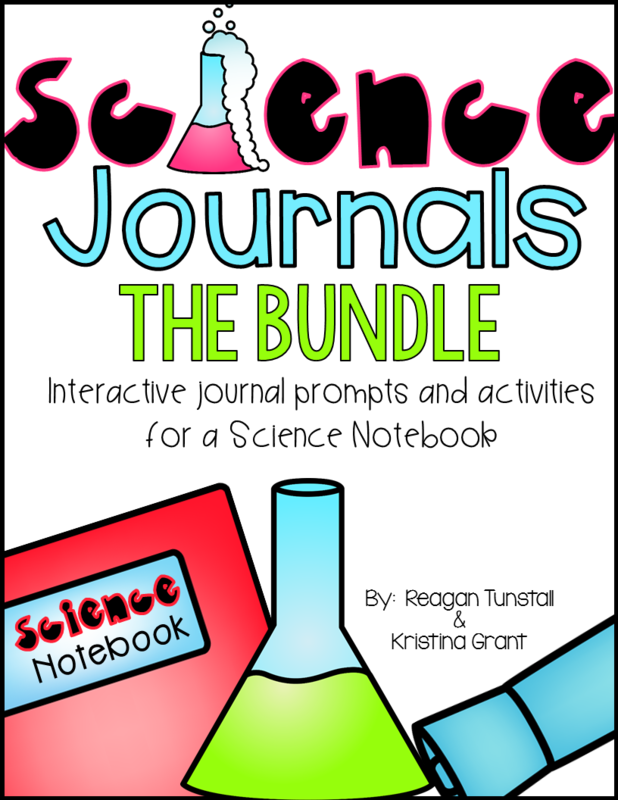 For some reason I can't find your awesome book labels on tpt… did you take them down? Is your small group table considered a horseshoe table? Can you tell me the dimensions? If it is considered a different type of table, can you let me know the name? I want to change out my bean-shaped table and your table looks perfect. your picture is very beautiful.. i love it.. nice picture. Wow, wow and wow! Beautiful. Uncluttered. Inviting. Excellent job! 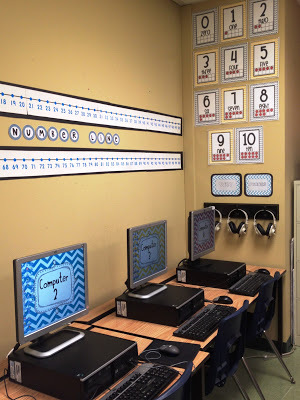 I just found your blog and am amazed at your classroom! Wow! What a work of art. Do you mind sharing your paint colors? I want to repaint my room and love the homey warm colors. Thank you! Your room is wonderful. We are not allowed to paint our walls. County maintenance has to do it and all walls have to be stark white. I did paint one wall as a log cabin and 2 walls with blue before this new "rule". I would love to have advice on how to make my smaller room without storage more cozy for my country camping kinders. An amazing learning environment! I have a few questions for you, I am moving from desks to tables this year. 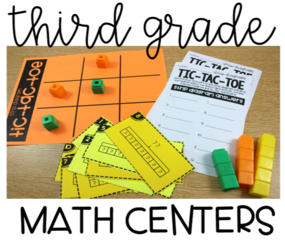 What materials are in the baskets on each table and where do your students keep their materials? Wowzers. This is great. Do you find the home-like atmosphere keeps the kids calmer? Just curious. This is so welcoming, organized and just a happy space. 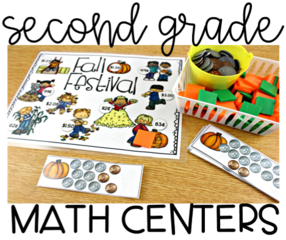 Your kiddos are going to love coming to their classroom everyday! Great Job! Love your room! Where did you get the great rug? 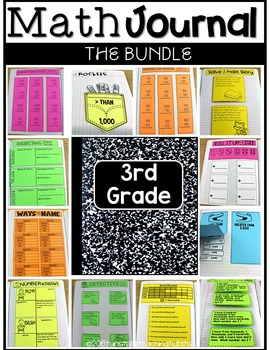 I NEED your ultimate book bin labels, but can't find them on TPT or Teacher's Notebook. Thanks! I just discovered your blog through pinterest. Your classroom is Fantastic! I'm your newest follower. Holy Schmokes! This is the most beautiful, peaceful. serene classroom I have ever seen. Found this link through cybraryman.com. We are working on a teachers' tool kit for Maine Education Association and this is one of the links in that document. WOW! 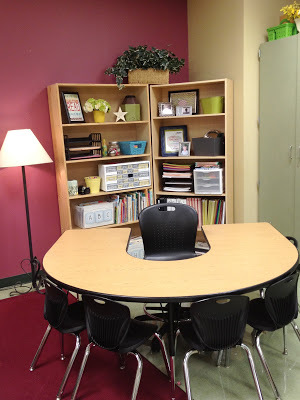 I am trying to think of how to make my classroom/resource room, more like this. Calm. Beautiful. Organized. I keep coming back to look at this room. It's amazing! W-O-W!!!! It is so neat, well organized. Very conducive to learning!!! It's no longer a classroom but a CLASSHOME! LOVE IT!!! Love your organization ideas!!! 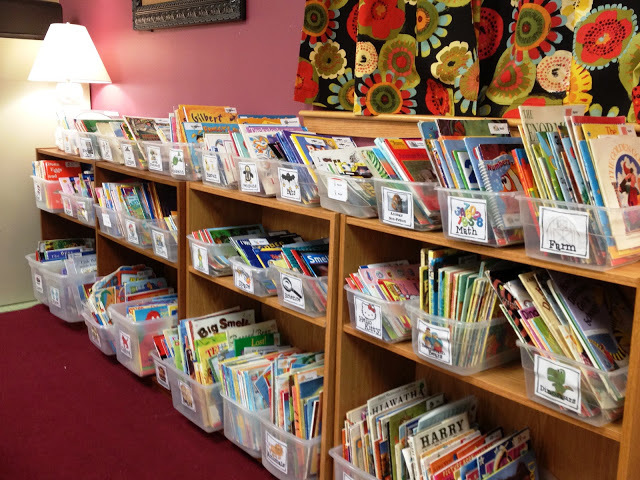 Do you recall where you got your bookshelves for your class library? Did they come with your room? Tks. :O) Happy Summer! WOW! What an amazing classroom!!!! I love how your classroom came out. I am looking at doing a makeover on my room and I wanted to know how it went with your children this past year. I am looking at the dates and it seems like you did this last year so any ideas? Things you would have done different. Great post! Been reading a lot about setting up my classroom. Thanks for the info here! Beautiful combination of self-regulating (calming) and stimulating. A perfect classroom environment! Well done! I love your room! I actually have the same rug as you (in your meeting area) in my living room in my home! Your room is beautiful and huge! I have a teeny tiny room. I am very inspired! I also love your Quiet Phones! I'm wondering where you got your alphabet cards above your SMARTboard? I'm having a hard time finding neutral ones that aren't too busy or silly. You have an amazing, ORGANIZED and comfortable classroom. Can I just ask what the overall cost of your "re-create" was…? 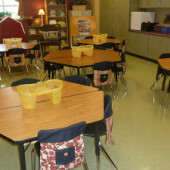 I am getting ready to re-do my own school age classroom and want it to be perfect so wondering how much "out of pocket" I should expect. Also, looking back, was it worth the time and effort? This is so beautiful! I would love to have such a nice classroom here in France! It must be very big! 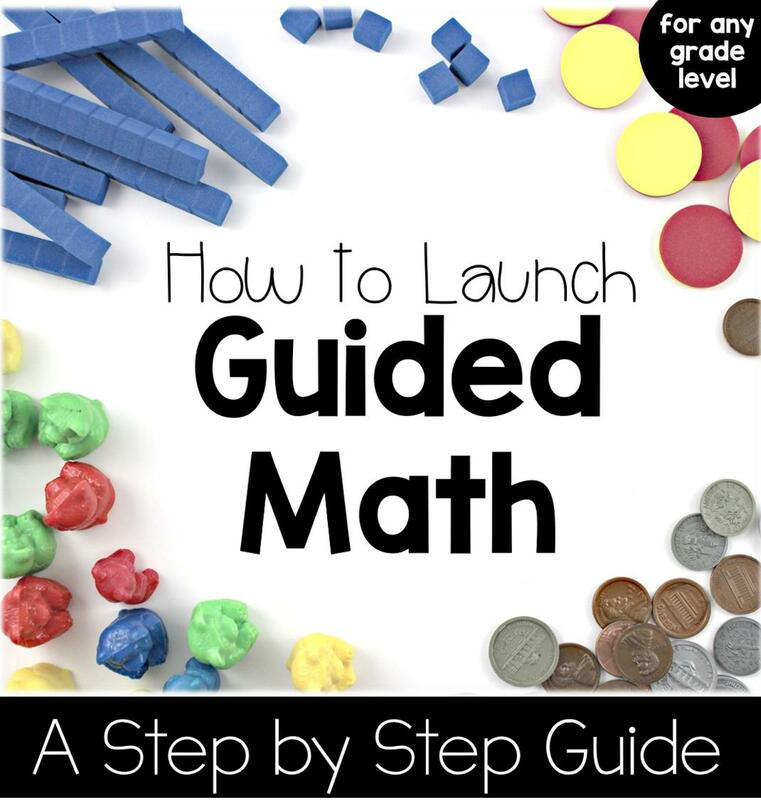 How many square feet is your classroom (or better how many m²?). Here in France, our classrooms, especially mine, are so sad compared to yours across the ocean!! Your room looks awesome. We are not allowed to paint ours! I wish we could because I would love to learn in such a homey atmosphere too! Where did you get your Daily 5 charts made up? I love them! I love the chevron signs on your desktop computers. How do I find these? I thought this was the teacher's lounge or a model classroom. Wow! That's impressive. Good on you! I'm a teacher in Mexico, you gave me the inspiration I needed to start decorating my classroom! This is the post with the chevron desktop backgrounds. Did you design these ? Would you be willing to share your design? I am sure you have something new by now!! 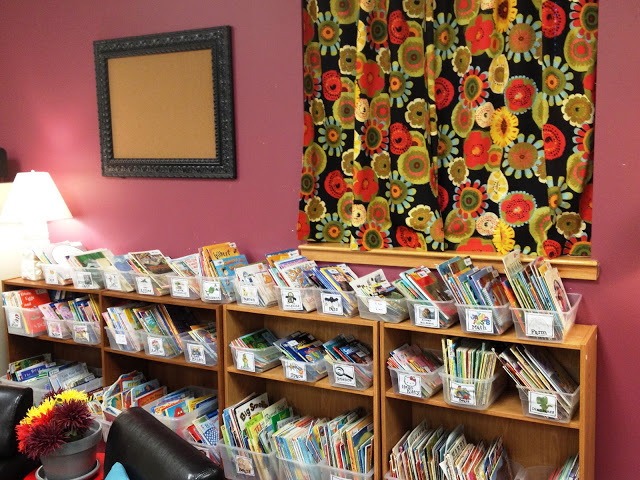 I love the organization of your classroom! I read through all the posts and a LOT of people asked where you got several of your items. It would be so great if you would share where you bought these items to help people that might need the same things as you´ve chosen. For instance, I am sitting here searching for gray area rugs and your blog came up; but alas, no listing of where you purchased it, and no replies anywhere in the questions addressing the same. I would love to see where you bought it. Just an idea…….